TRUE LUXURY AT ITS FINEST!! 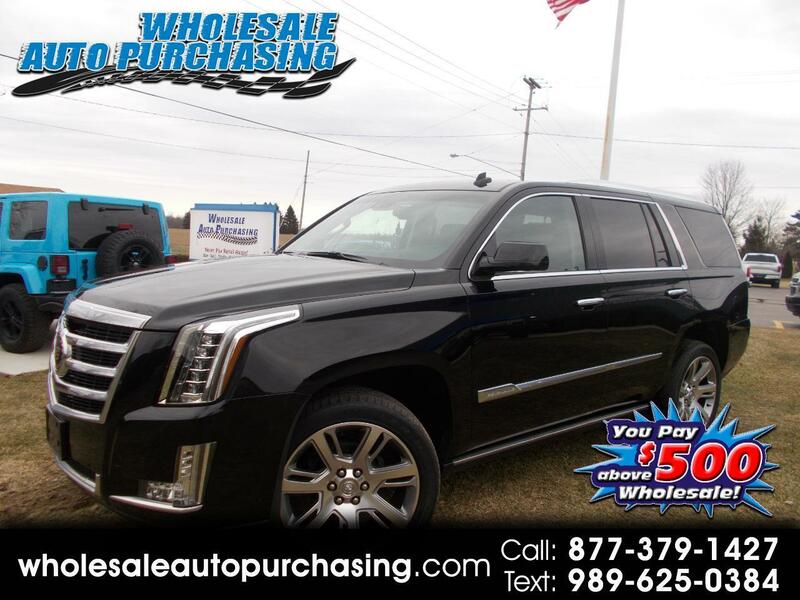 2015 CADILLAC ESCALADE PREMIUM 4X4 BLACK BEAUTY!! OMG LOOKY HERE!! Just in Today Is This 2015 Cadillac Escalade Premium 4X4 (Four Wheel Drive). 6.2 Liter V8, Automatic 6-Speed Transmission. Beautiful Jet Black Pearl Metallic Exterior. Genuine Black Heated & Cooled Leather Interior!!! TRUE LUXURY AT ITS FINEST!! The Best One Word Description For This Caddy is ”WOOOOOW”!!!!!!! Full Power Options Including Navigation, Backup Camera, Moon Roof, Power Boards, 22" Wheels!! This Is One Impressive Head Turning Caddy!!! Make Your Neighbors Jealous With This Bad Boy In The Driveway!!! SAVE THOUSANDS buying from us. Just serviced and is a local clean car fax nonsmoker!! Good luck finding one this nice at this price!! CALL NOW because it will go quick! Lease-To-Own Option Available For Well Qualified Buyers!!! 5yr 100k Mile Certified Warranty. We have the best price guaranteed. Why? Because we are WHOLESALE AUTO PURCHASING, NEVER PAY RETAIL AGAIN!! !, Don't pay Retail Buy WHOLESALE!! $500.00 above wholesale - Call 1-877-379-1427 to set up a viewing and a test drive. Thank you for considering Wholesale Auto Purchasing in Frankenmuth, MI for your next vehicle purchase. We Currently Offer Financing Rates as low as 1.9% Call 1-877-379-1427 to set up a viewing and a test drive! !